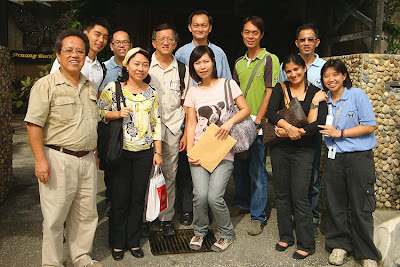 Last weekend I joined a team of staff from NParks on a study trip to Penang. The team, comprising staff from various Divisions in NParks, went on a fact-finding mission to learn more about setting up a butterfly farm as well as visiting several specialised gardens and horticultural sites to gather new ideas for their respective areas of work and for a possible future facility under NParks to enhance the conservation of butterflies and biodiversity in Singapore. The team of nine set off from Changi Airport early on Thursday morning, and arrived at Penang just after 9:30am. 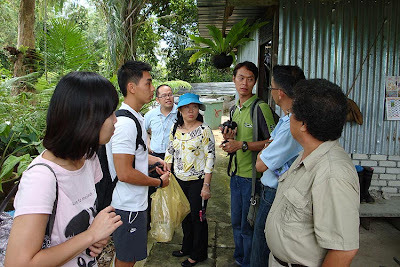 We headed straight for the Penang Butterfly Farm at Teluk Bahang in a mini bus kindly sent to pick us up. 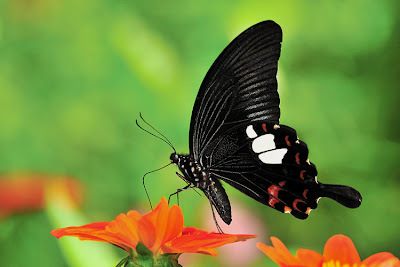 Seven of us reached the Butterfly Farm (why seven?? Two members were, erm... indisposed, but that's another story for another time). 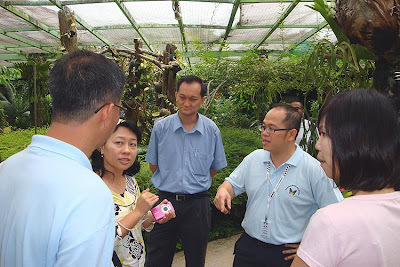 We met David Goh, Joseph Goh, BT Chin and Kuennie Lee who showed us around the flight enclosure and features of the 1,500 sqm facility which features, on average, about 4,000 butterflies from 100 species. As it was nearing lunch time, David and Joseph hosted the Singapore entourage at the newly opened Papilio cafe within the flight enclosure. After a yummy meal, and lots of butterfly talk, the team moved off to the back-of-house facilities where the breeding cages and open areas where the early stages of the species featured in the flight enclosure were 'farmed'. It was eye-opening to know that the breeding facilities was about five times the size of the flight enclosure, and spread over three other sites. At one of the sites, were durian trees (yes, we Malaysians and Singaporeans can't resist talking about the King of Fruits) laden with lots of durians. 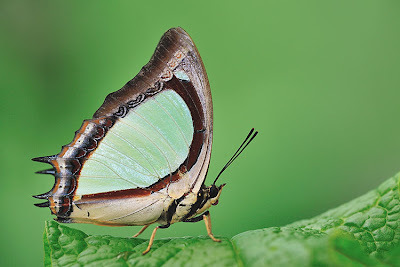 We saw the various types of breeding cages, from small containers and meshed boxes to entire enclosures where the gravid female butterflies oviposited on trellises and pots of their host plants. 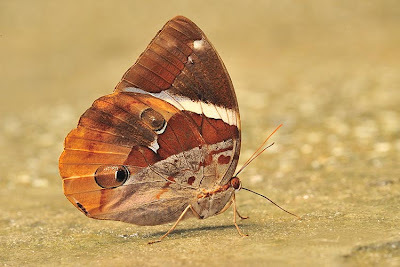 Amongst the species we saw, were the Rajah Brooke's Birdwing, Batik Lacewing, Cruiser, Archduke, Clipper, Autumn Leaf, Tree Nymph and a whole host of medium to large butterflies featured at the main flight enclosure. We ended the tour of the breeding facilities with a generous helping of some of the tastiest durians that I've had this season. Thanks to David Goh, we got really high quality durians at the roadside stall just opposite the Penang Butterfly Farm. 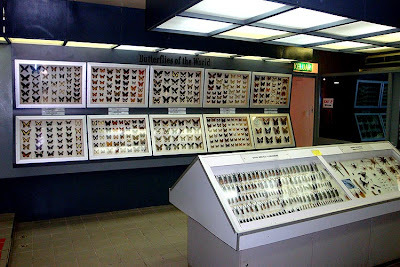 After having our fill of durians, we did a quick tour of the flight cage again, and out through the museum displays and antique shop. The team thanked David, Joseph and their staff, for their fantastic Malaysian hospitality and generous sharing of knowledge and information about the Penang Butterfly Farm's operations. At around 4:30pm, we got into our taxis and headed back to the Copthorne Orchid, happy and burpified with durians on our breath. After checking in and a quick freshening up, the team, finally nine of us, (inclusive of our two lost sheep), checked out the night scene at the Gurney Plaza. After a sumptuous dinner, it was a quick round of shopping and then a movie for the younger ones in the team. 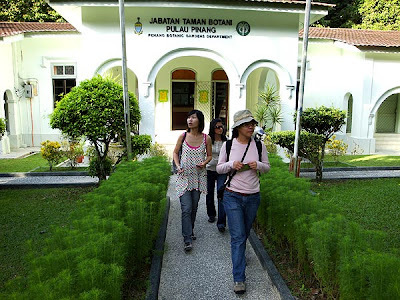 The next day, we were up early and in our chartered mini-bus, we headed for the Penang Botanic Gardens. 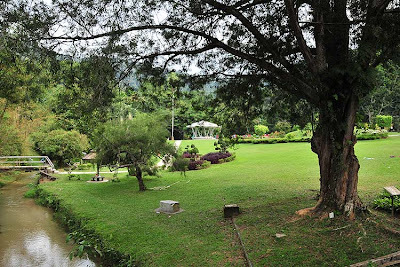 More popularly known to Penangites as the "Waterfall Gardens", the Penang Botanic Gardens was established by the British way back in 1884 from an old quarry site. Covering about 35Ha at the main gardens, the PBG is a popular spot with locals and visitors alike. The place was crowded, even though we visited on a Friday morning, with joggers, tourists and school children engaging in various outdoor activities and out for a morning exercise. The team checked out various plants and shrubs and the feature collections at the PBG. 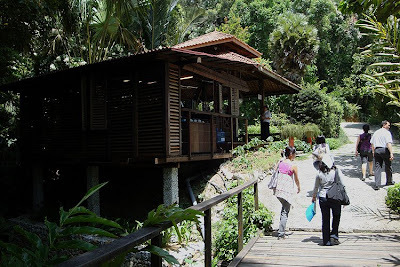 After about 2 hours, we left the PBG and headed off to Teluk Bahang again, this time to the Tropical Spice Garden. 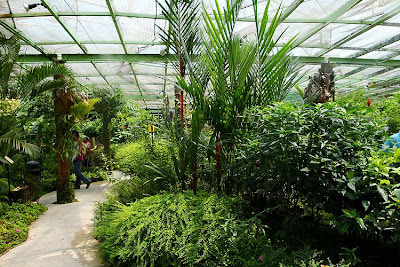 The Tropical Spice Garden first opened its doors to the public in November 2003, as an ambitious, yet holistic eco-tourism project showcasing over 500 varieties of exotic fauna and flora (with an emphasis on spices), spread over 8 acres of secondary jungle. The Spice Garden features over 500 varieties of tropical flora specially selected from all over the world. 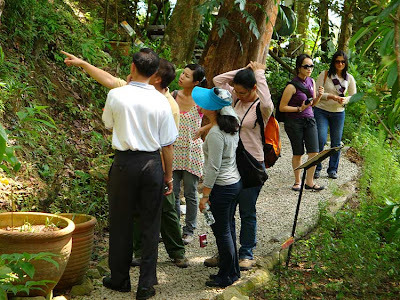 Divided into 3 designated trails, Jungle Trail, Ornamental Trail and Spice Trail landscaped on natural jungle terrain, each trail offers sufficient interest for a 20-45 minute walk. Our team had a friendly guide to take us around, carefully explaining the numerous spices and herbs and the uses in cooking, medicine and so on. 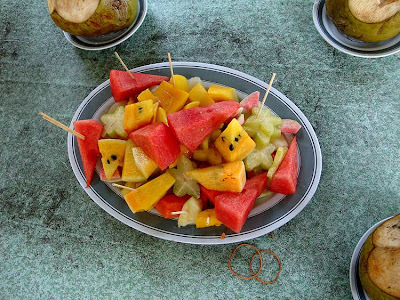 As we could hear several growling tummies as lunch hour approached, the team hopped on to our chartered mini-bus and headed to the Tropical Fruit Farm. 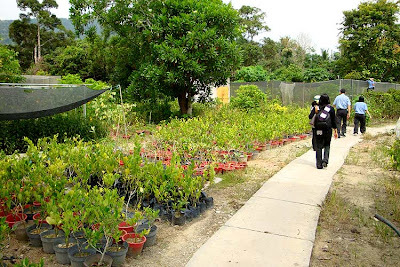 Penang's Tropical Fruit Farm is situated about 800ft above sea level on the hilly terrain of Teluk Bahang in Penang is an ideal location for cultivating many types of tropical and sub-tropical fruit trees. The orchard covers 25 acres and it was developed back in 1993 to conserve the rare and exotic fruit trees. As we were running short of time, we skipped the fruit farm visit, and opted to have a lunch of fruits (aren't we healthy!) at the main visitor centre. After downing two platters of delicious local fruits (surprisingly, no durians!) the team got back on the bus and headed off to the Bayan Lepas International Airport, and to bid adios to the Pearl of the Orient, and a 'fruitful' study trip of two days.